On a dark, grey and rainy day in Southampton, it seemed even more poignant to remember those who had fallen in the Great Wars, Iran, Iraq, Afghanistan and Syria, accompanied by the distant sound of cannons fired from Marchwood military port. Like many other buildings around the country on this day, Compass House in Southampton was no different and fell silent at 11am. Residents from HM Revenue and Customs (HMRC), UK Border Force and Civil Service Local were joined by colleagues from the Department for Work and Pensions (DWP), Maritime and Coastguard Office and public sector neighbours Radio Tactics to remember the sacrifice of those who gave their lives that we may enjoy our freedom. of the brave men and women who did not shrink in their duty so that we may have a better tomorrow. Wreaths were then laid by senior managers representing the attendees. 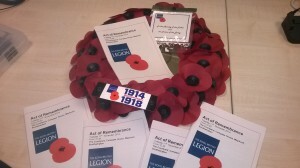 A collection was taken for the Royal British Legion. On Monday last week I showed a few of my colleagues a photo of a hat with a poppy that I had crocheted for my baby grand-daughter to wear to her first remembrance parade. Several of them asked if I could make them a poppy. I made 11 that evening, brought them into work each and within 20 minutes they had all gone. I then started getting orders for them and by Friday I had made and sold 52. She has already had orders placed ready for next year.